We are excited to announce that A2B is joining forces with citycarshare.org as part of its San Francisco ebike share pilot scheme that is launching this week. Now, with the addition of ebikes as part of the scheme, the organization will be able to truly offer a greener, easier way to get around the hills of the Bay Area, and, at the same time, reduce congestion while making the streets much quieter and the air cleaner! What’s more, there are no mileage fees, of course, making getting around the city not only a clean, green option, but a cheaper one too. City CarShare's A2B Alva+ has throttle and pedal assist modes, giving riders the option to have a burst of power when they pedal, as well as the ability to accelerate at the twist of a throttle. 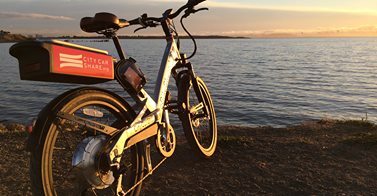 In partnership with Bike Station, the organization that offers a safe and convenient way to park a bike, the ebikes will be based in its Berkeley BART location. The ebikes will be offered at a special promotional rate and will be available Monday to Friday, 9am to 6pm. Getting around town has never been easier.